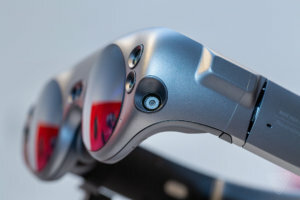 Some three years after their tantalising launch video, Magic Leap’s reality glasses have gone on sale. To date some $2.3bn dollars have been invested in the start-up with significant support from companies such as Google, Alibaba, and AT&T. 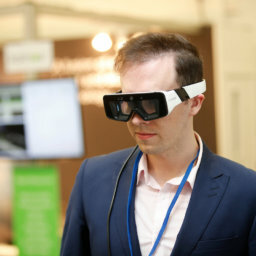 There are three components shipping to the developer community in the US this week- the glasses themselves, a small computer which is tethered to the glasses, and a handheld control unit. The price-point of $2,295 will be approximately 20% cheaper than rival Hololens. Reviews have – forgive the pun – been somewhat mixed, but it’s worth remembering that those who have had the chance to try the system were specially selected tech-journalists. As the developer community start to get their hands on MagicLeap we will get a more broadly based set of insights into its capability. Adi Robertson was one of those who got an early preview of Magic Leap. 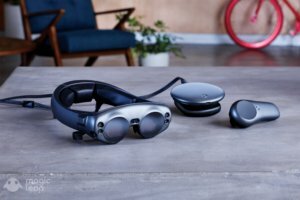 Writing for Verge, she notes that “ Edges glowed slightly, text was a little fuzzy, and some objects appeared slightly transparent” On a positive note she notes that Magic Leap has improved on Microsoft’s HoloLens in respect of its field of view— it’s got a 50-degree diagonal field of view, which works out to a rectangle that’s around 45 percent bigger. Another early trialist was Wired’s Jessie Hempel, who after some headset fit problems was able to report positively that “images were crisp and solid (as solid as virtual reality can be, anyway). With a click of the controller, I pinned a Helio browser on the wall to my left. I opened a Wayfair demo in a second browser directly in front of me. A plush chair appealed to me from the Wayfair website, so I used the controller to drag it directly into the living room and see what it might look like. These experiences are certainly on par with other augmented-reality and virtual-reality demos I have seen. Are they really mind-blowingly better than the competition? Not yet. But Magic Leap does have a product, and despite its naysayers, it’s very close to being in all of our homes”. So stand by for more interesting times as a much heralded arrival is finally here.